EA and Bethesda have had their E3 2017 press conferences and they were all about games, games and more games. Here, we list all the games that these two publishers presented at E3 2017. Battlefield 1 fans, rejoice. In addition to getting multiplayer maps set in the night, there is a new DLC that will launch soon. It is called ‘In The Name of The Tsar’ and you can out the trailer below. If the Fast and Furious franchise had a love child with the Burnout franchise, it would be called Need For Speed Payback. You can check out the E3 gameplay trailer below. Have you played Brothers: A Tale of 2 Sons? If you enjoyed it, then A Way Out is definitely worth looking forward to. The game is meant to be played co-op only, be it split screen or online. From the trailer shown at E3, the game looks very interesting. Check out the trailer below. Anthem is Bioware's take on a Destiny-style game, with squads of "freelancers" venturing from the safety of a fortress wall in their exo-suits into a beautiful but hostile environment. In Anthem you'll be heading out in a fully customisable Javelin exosuit, which will let you run, fly and swim through some of the lushest landscapes ever seen in a videogame. This is Bioware's new IP and it is all set to take advantage of the Xbox One X’s hardware. We are excited to get our hands on Star Wars Battlefront 2 and from what we saw at E3 2017, it looks like the game will be one action-packed multiplayer adventure. If you are interested in sports games then you were paying attention to what EA announced at E3 2017. If not, it's the usual - a new Madan game, new NBA game and new FIFA. check out the trailer for FIFA 18 below. Another publisher that showed-off games at E3 2017 was Bethesda. There was a mix of old and new at Bethesda's E3 2017 conference. Following is a list of the games that were announced. Dishonored 2: Death of The Outsider DLC is aimed at taking out The Outsider, a character who has been present since the first game. The Outsider is the one who gives you the powers you have in the game and in this DLC, his time is up! 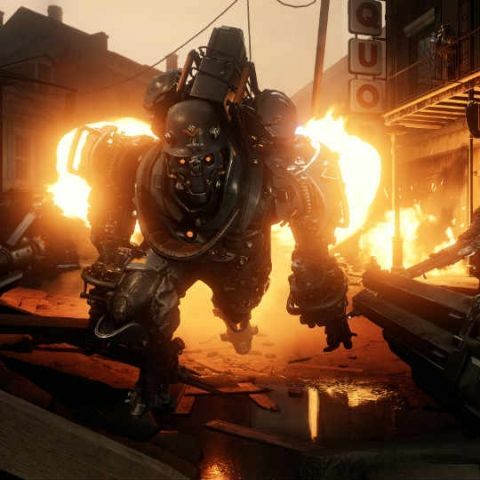 At the very end of Bethesda's E3 conference, they showcased Wolfenstein II. Like the first game, this is also set in a utopian future where Germany has won the World War. There is very little known about the game, but it seems familiar to its predecessor and they are connected in some way as Blascovich is back in action. Two of the best games of 2016 are being redone to work in VR and from what Bethesda showed on stage, they both look awesome. The Evil Within 2 brings another crazy horror story to you with breathtaking visuals from the veteran designer, Shinji Mikami. Mikami also has games like Resident Evil and Vanquish under his belt. The trailer shows various zombies, a rustic house in a dark stormy setting, with an eerie version of “The ordinary world” playing in the background.